Search “options and volatility” in Google and you’ll get a dozen websites that say the same thing: option buyers want high volatility and option sellers want low volatility. Oddly enough, this old and relied upon rule of thumb isn’t completely correct. In reality, as an option trade plays out, trend has a far more powerful effect than volatility on final P&L. The charts below illustrate the P&L of a long put in each scenario. The red path is the price action of the underlying stock over the course of the trade. Notice how it moves along smoothly with little volatility. In this example, the long put would expire at a low price. 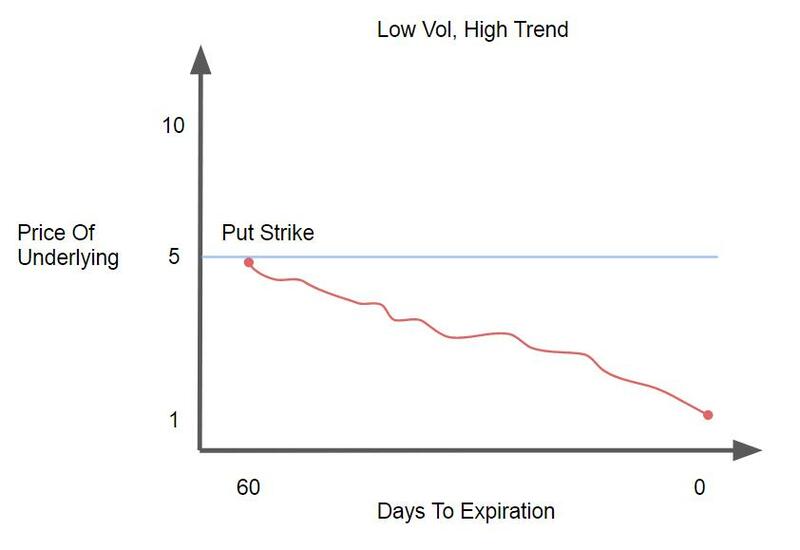 The underlying (red line) isn’t far enough away from the strike price at expiration. A trader who bought this put would’ve lost money. In this situation the put holder would be sitting on a huge gain! The underlying trended far away from the put strike and the option expired well into the money. Just like the last example, the red line moved smoothly. But in this case it happened to trend down instead of sideways. Despite low volatility, the put holder made some serious money. 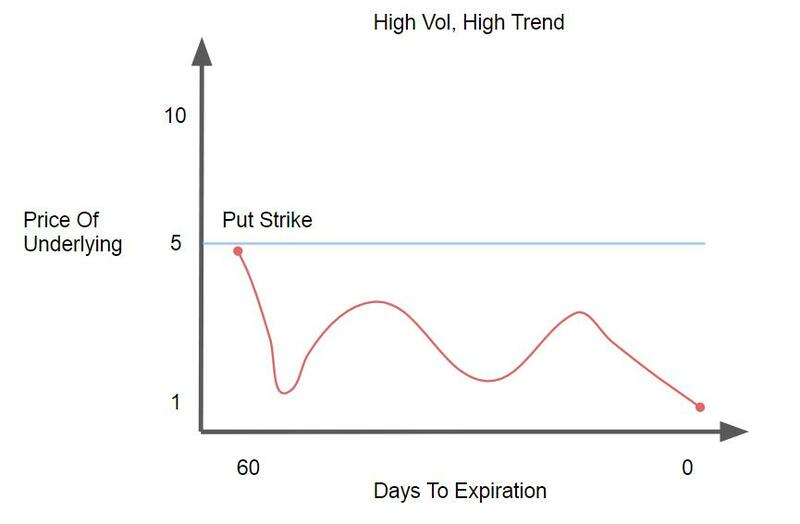 The “rule of thumb” requiring high vol broke down. The put buyer lost money here. The underlying didn’t trend far enough away from the strike to overcome the option premium. There was high volatility throughout the life of the trade, but the put buyer still got taken to the woodshed. The price of the underlying at expiration was all that mattered here. 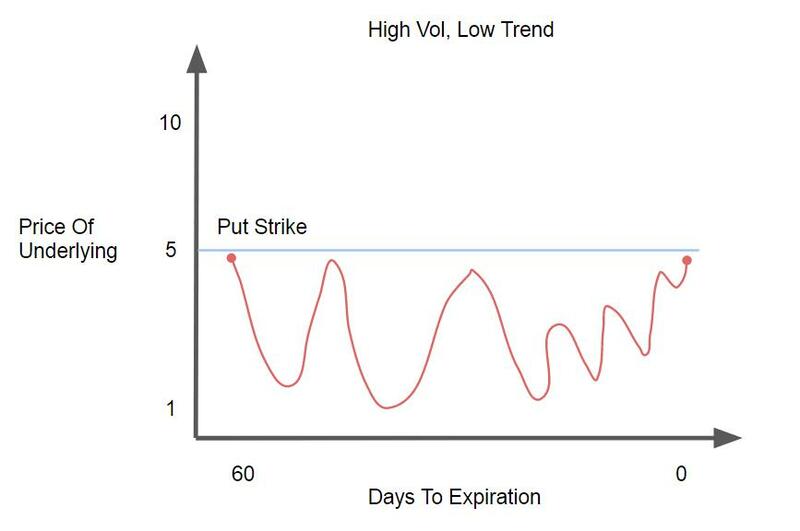 The volatility “rule of thumb” broke down again. In this final example, the put buyer received a nice profit. The underlying trended downward with steep pullbacks, but price was far enough away from the put strike to deliver gains. In this situation many traders would think the high vol over the course of the trade contributed to profits. But in reality it didn’t. The trend created the profits. Volatility didn’t have any effect on the final P&L of these scenarios. The trend is what mattered. In examples 1 and 3, the put buyer lost money in both low and high volatility. The underlying had no trend. In examples 2 and 4, the put buyer booked some nice gains because the underlying trended. Again, the volatility of the trend did not matter. 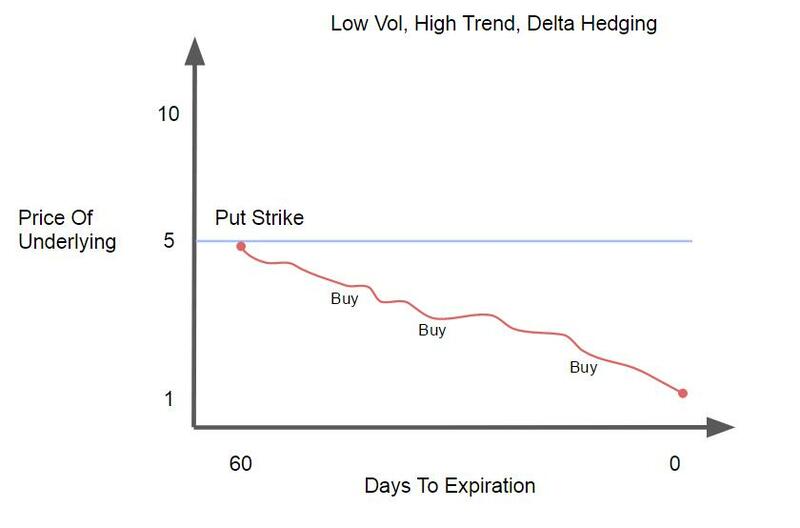 If you do not delta hedge over the course of a trade, all that matters is where the underlying expires relative to the strike price. 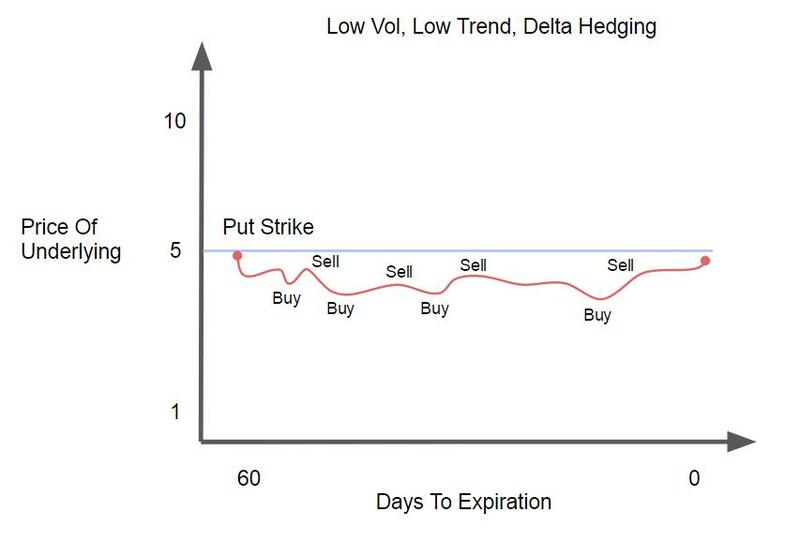 Delta hedging consists of buying and selling stock against an option to cancel out its directional bias. Without offsetting delta (direction), an option trade becomes a bet on trend vs. consolidation, not high vs. low volatility. 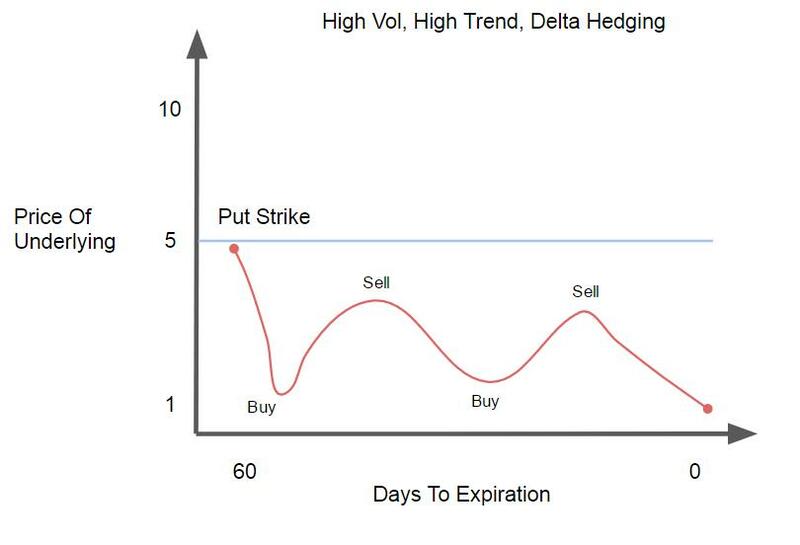 If you want the “rule of thumb” to hold true, you need to delta hedge over the course of your trade. Market makers and investment banks typically delta hedge to create a pure play on volatility rather than direction. Here’s how they’d handle the same long put as above, but this time with delta hedging. If the market maker is long a put, he’ll immediately buy some stock against it to hedge out the directional component. As the stock starts falling the put’s short delta will increase. This will cause the market maker to buy more stock during the dip to offset it. As the trade goes on, the market maker will keep buying stock on dips and selling on rips. These delta hedges end up being profitable trades because he’s buying low and selling high. By expiration he’ll generate a significant amount of gains from just buying and selling the stock. The value of the option decayed to almost nothing by expiration (the underlying expired close to the strike) but the profitable hedge trades made up for that loss and then some. The market maker made money! Notice how different this trade turned out compared to example 3 with no delta hedging. In the delta hedging example here, the volatility of the underlying had a much bigger impact on the P&L than the trend. 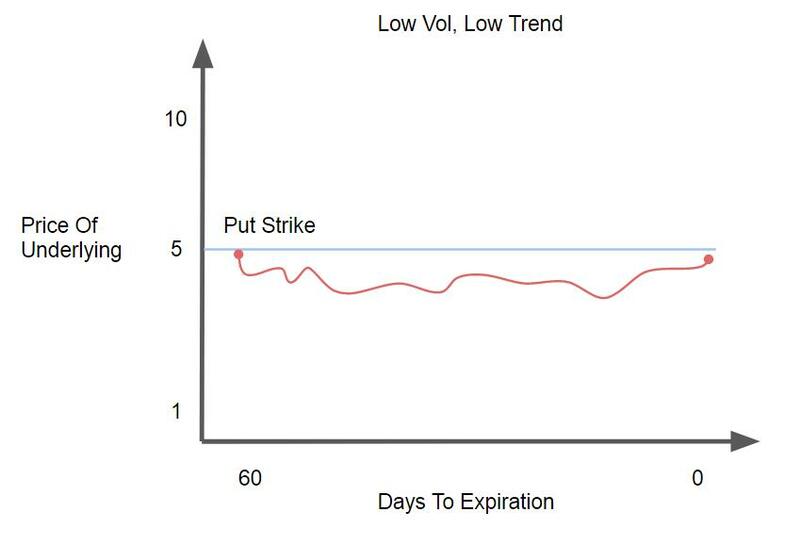 So the “rule of thumb” — option buyers want high vol — only applies if the trader is hedging delta. If he isn’t hedging delta, then high vol won’t do much for him. He’ll still lose on the trade if the underlying expires near the strike. Here the peaks and valleys of the underlying aren’t nearly as intense as in the prior high vol example. The market maker still buys low and sells high each time the underlying moves, but with much less profit than before. By expiration the delta hedging trades aren’t profitable enough to offset the option premium (which was lost because price was too close to the strike at expiration). The market maker ends up losing money. 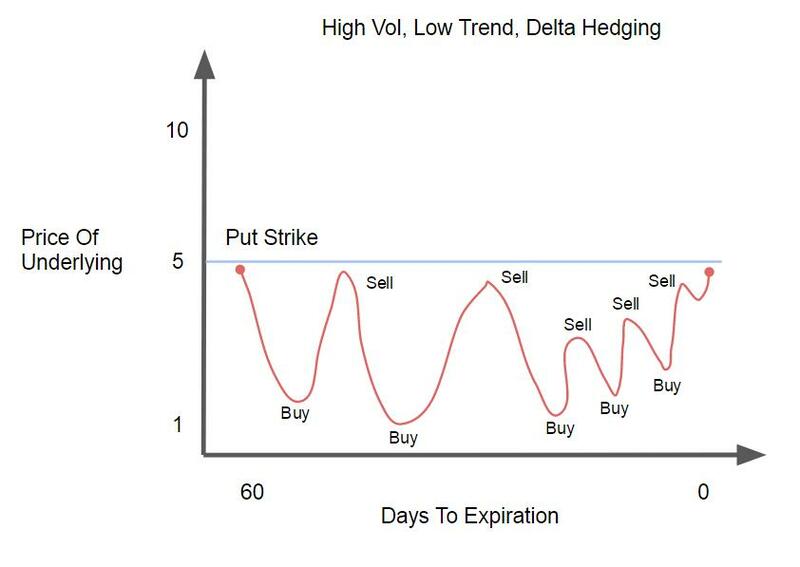 By now it should be a little easier to see why option buyers who delta hedge want wild, highly volatile oscillations. Without the high vol, their hedges don’t make enough money to make the trade profitable. Most people who buy puts are used to winning big when the underlying has a large downward trend. But this isn’t the case for a market maker who’s delta hedging. The downward low vol trend had the market maker buying dips with no rips to sell into. The result — a long stock hedge that was continually averaged down over the life of the trade. In this case, the long put had a nice gain because of how far away the underlying trended from the strike price. But the hedge ended up being a huge loser that negated the option gains. Unlike the trader who didn’t hedge and let the trend work for him, the market maker didn’t do so well. The market maker’s position was more reliant on the volatility of the underlying rather than the trend. Low vol meant a poor end result. In this last example, we still have the same downtrend, but this time with more spikes along the way for the market maker to sell into. These spikes allow the delta hedges to make money. And at the same time, the long put has a nice gain because the underlying expired far away from the strike. The high volatility of the trend made it possible for the market maker to profit. Traders who don’t hedge delta rely on the trend of the underlying more than its volatility to profit. Traders who do hedge delta rely on the volatility of the underlying more than its trend. It usually doesn’t make sense to hedge your delta unless you have a professional commission structure. This is why so few do it. All those hedging trades rack up commissions. And the execution of those hedges requires a lot of screen time or advanced software than can do it automatically. Do I believe the underlying will trend or consolidate over the life of the option? If your answer to that question is “I think the underlying will trend”, you should buy optionality. The underlying will trend away from the strike price and you’ll make money on the option you purchased. If your answer to that question is “I think the underlying will consolidate”, you should sell optionality. The underlying will stay close to the strike price and you’ll collect the premium from the option you sold. For more information on how we like to trade options at Macro Ops, check out our special report here. https://i2.wp.com/macro-ops.com/wp-content/uploads/2017/04/Do-Buyers-Of-Options-Benefit-From-High-Volatility.png?fit=983%2C681&ssl=1 681 983 Alex Barrow https://macro-ops.com/wp-content/uploads/2016/02/Macro-Ops-logo-e1456504515714.png Alex Barrow2017-04-13 06:52:252018-02-26 13:18:42Do Buyers Of Options Benefit From High Volatility?